China, Northern Song Dynasty Style, late Qing reproduction c. 19th century Savior of those in distress and patron of women seeking children Guan Yim is the divine Intercessor who ensures a bountiful harvest and abundant children; and who also carries departed souls to the Pure Land of Amitabha. 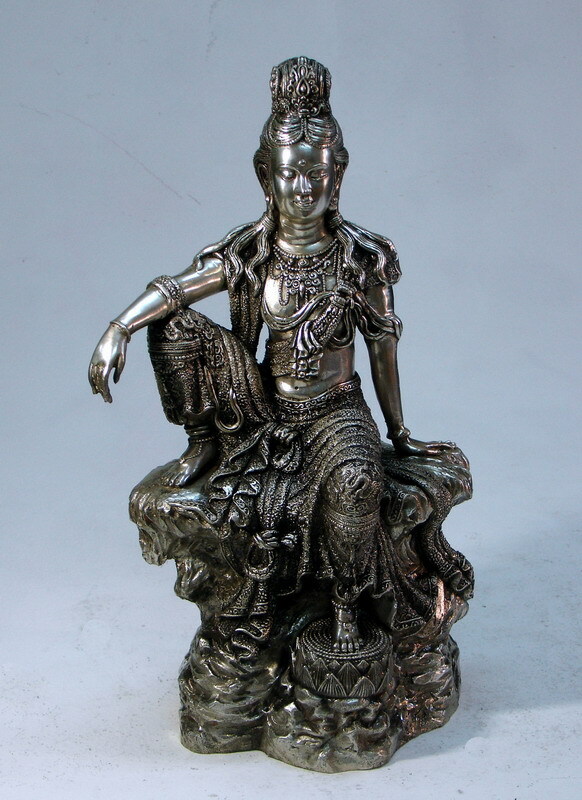 Originating in the Indian male figure of the bodhisattva Avalokitesvara Quan Yin increasingly adopted feminine characteristics as Buddhism moved north across the Himalayas. This help the new religion accommodate itself to the more mundane Chinese preoccupation with fertility and procreation especially of male offspring. 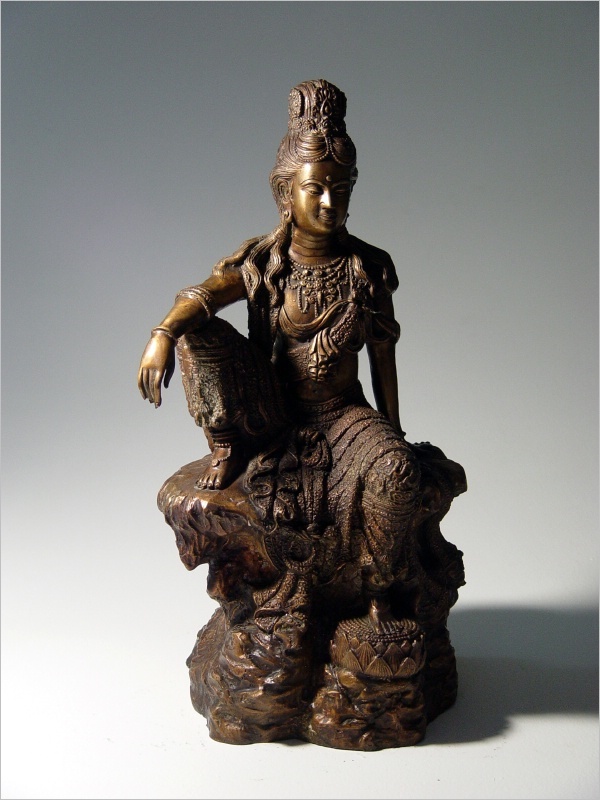 This Chinese Song dynasty image mid-way in the gender transition from the Indian and masculine icon of Avalokitesvara to its Chinese and feminine variation adopts the languid seated pose known as lalitasana - seated with the right hand resting on the raised knee - suggesting the confidence of royalty and the self-assurance of imperial power. Style reinforces the courtly image of ease femininity and grace. 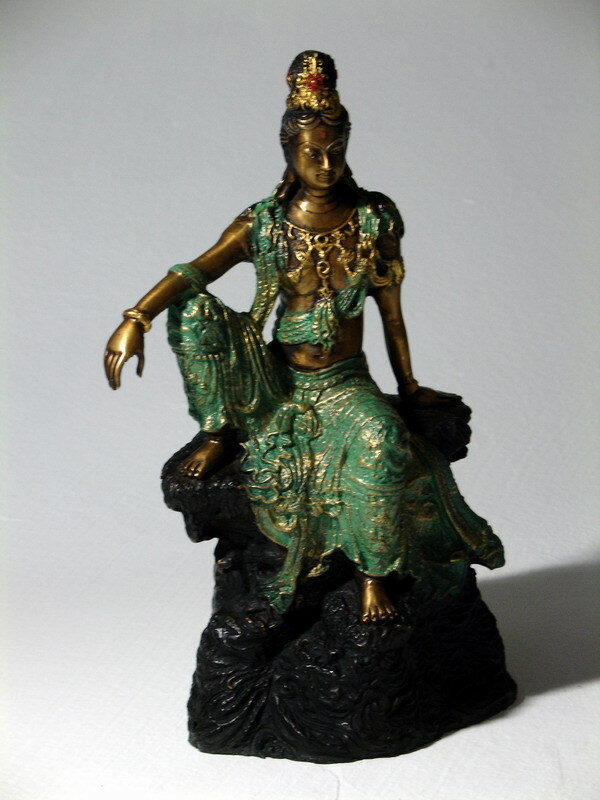 The general softness of the modeling and the refined treatment notable in details such as the slender fingers patterned drapery and complex coiffure typify the manner in which as Kuan Yins feminine characteristics emerged aesthetic increasingly came to dominate the fashioning of its image. Size : H: 12" W: 7" L: 6"